If you’re a parent, you know childhood goes by so quickly. The baby who was just crawling across the floor is now the teenager grabbing the car keys and headed out the door -- and the smile that started out with just one tooth is now the smile of a confident young adult. No matter what stage of life you are in with your children, Dr. Bannan and our staff at Water’s Edge Dental want to make sure their teeth are healthy and beautiful. If you’re looking for children’s dentistry in South Daytona, then you can count on Dr. Bannan to provide your son or daughter with all the services they need from infancy on up through adolescence and into adulthood. 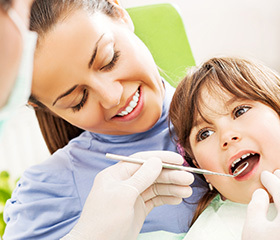 Even before you bring your child for his or her first visit to the dentist, oral health care is very important. 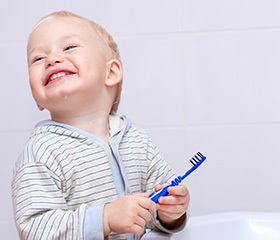 Get your child accustomed to having their gums and teeth cleaned during infancy. You can use a soft cloth dampened with warm water to clean their gums after feeding, and then advance to a small soft toothbrush and water when that first baby tooth erupts. Toothpaste should not be used until they are old enough to spit, which is usually around the age of two for most kids. After then, be sure to select fluoride toothpaste endorsed by the American Dental Association. And don’t forget to floss, too, in order to remove bacterial plaque that can lead to tooth decay and gum disease. The American Academy of Pediatric Dentistry recommends that children have a baseline visit with the dentist around their first birthday. At this appointment, Dr. Bannan will be able to check on the development of your son or daughter’s teeth and bite. Then, around the age of two or three, they can begin coming to see South Daytona family dentist Dr. Bannan for twice-yearly dental checkups just like mommy and daddy. 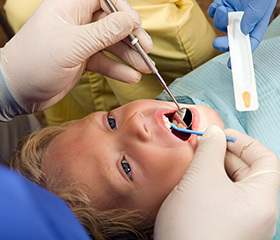 At these checkups, we’ll clean and polish their teeth, check each tooth for any signs of developing cavities, examine the condition of their gums and continue to monitor the development of their bite. Battling tooth decay is a constant for kids. In fact, tooth decay is a more common chronic condition than both asthma and hay fever. To help your children avoid cavities, Dr. Bannan may recommend dental sealants and fluoride treatments. Sealants place a barrier between your children’s molars and decay causing bacteria. Fluoride is a mineral that helps to strengthen enamel, so your children’s teeth are better shielded against decay. Contact Water’s Edge Dental today if you have any questions about our kids’ dentistry in South Daytona or if you’re ready to schedule an appointment. Our office is located in South Daytona, FL, and we welcome patients from the areas of Daytona Beach, Port Orange, Holly Hill, Edgewater, Ormond Beach, and beyond.